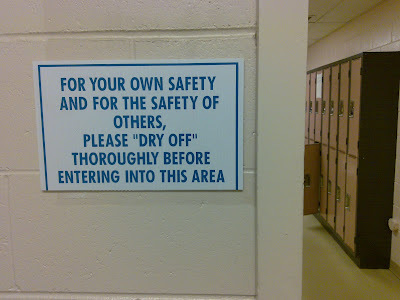 The “Blog” of “Unnecessary” Quotation Marks: you "dry off"
This is from Cara's gym. In her email to me, Cara confessed to storing her towel in a locker, beyond this sign, so she is happy for quotation mark borne ambiguity. I'm wondering what exactly they DO expect you to do before entering the locker area? Just shake off most of the water droplets. You know, like a dog. Dang it, somebody beat me to it. to me the quotation marks imply that I should know that dry off doesn't really mean "dry off", it's like they're writing it with a wink behind it.